VGA stands for Video Graphics Array. A VGA cable is a device used to transfer video signals. It does this by acting as a link between the computer and the monitor or between the computer and the television screen. The video graphic cable comes in two types, male and female connector. It is made of high quality materials and carries an unconditional warranty. Chiefly, it is an electronic connector with three rows of 15 pins on it. A VGA cable has multiple uses in the electronic field. It is used as a connector in electronic devices like laptops, televisions, monitors, video cards, and other electronic devices. It is used to connect and send signals between computers and monitors, between computers and televisions, and between computers and laptops. A standard 6ft (1.8m) cable can be bought for as little as $2.50 , or under $8 for a higher quality cable with screw attach from Amazon Basics. Numerous types of Video Graphics Array cables are available in the market, be it the small or mini VGA port or the full size cables. 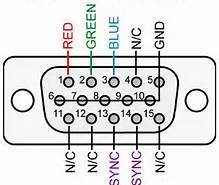 Other names that are used to refer to such cables are the RGB connector, HD15, Mini 015, Mini D15, Mini sub D15, HDB-15, and DB15. Examples of the male connectors available are HD15, DB13W3, 4BNC, 5BNC, and HD15/6-pin Mini-Din PSZUSB cables. These are commonly referred to as connector one. On the other hand, the second connectors include HD15 male, HD15 female, 4BNC male, HD 15 female /6PIN Mini-Din PS2 male, HD 15 female/ USE B male, and the 5BNC female cables. Some other types include the VGA adapter, VGAs splitter, the KVM, SVGA , VGA to BNC breakout cables , BNC to BNC breakout cables , VGA to RCA breakout cables , and sun DB13W3 cables. Some of these cables come with special connections. For instance, there are those that are assembled, others have ferrite beads, while others have no ferrite beads. Related Article: What are Ferrite Chokes? The video graphics array cable works by carrying the electronic signals and data from one hardware device to another. The signals are normally in form of video signals. The cable functions by carrying analog components of the red, green, blue, horizontal, vertical, and VESA data. There are different sizes of the VGA cables available, from as small as 0.75 feet to more than 30 feet. Moreover, these video graphic cables come in two different colors: black and beige. Additionally, the cables have either the double or the triple shielding that comes with it. Other features include a cable jacket rating of plenum. These cables come in a wide range of prices based on their length and type. There are cables of all types for every client, the cheapest can be found at less than $10, whereas there are those that cost more than $400 per cable. David Johnson is a freelance writer and blogger. He has an excellent knowledge about all kind of Computer Peripherals like, VGA Cables, VGA port, VGA adapter, Mini 015 and many more. He takes great delight in sharing this knowledge through his articles, which are fresh, insightful and interactive.